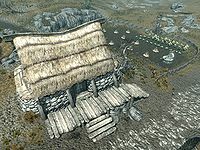 Cowflop Farmhouse is a small farmhouse located in Rorikstead. It is home to Ennis and Reldith, who are both farmers. It is at the eastern end of Rorikstead, along the road that passes through the village. It is next door to Frostfruit Inn. It contains only one zone, Cowflop Farmhouse. There are wooden steps leading up to the entrance from the road. There are two lavender and a purple mountain flower found beside the building. It has a large, picturesque pasture to the east and consists of a grain mill, twelve bushels of wheat, a chicken coop containing two nests, two chickens, fifteen cabbages and eighteen potato plants. During the quest: A Night To Remember they will also own a beloved goat named Gleda. The front door is novice-locked the majority of the time. It is a typical farm building consisting of a simple one room home, that is fully stocked. The house may look modest, but it does have some worthwhile loot hidden away. Upon entering there is a cupboard on the left against the southwest wall holding various pieces of cheese, a cabbage, five carrots, five garlic bulbs, a potion of minor healing and a potion of True Shot. In the western corner is a food barrel and a basket containing three cabbages. Next to these along the northwest wall is a long wooden table. On the table is a bottle of wine, a bottle of alto wine, two gourds, two apple pies, a hunting bow and two iron arrows. To the right of the table is an unlocked respawning wooden chest containing leveled items, and hanging from the ceiling above are two garlic braids, a bunch of frost mirriam and a bunch of elves ear. Against the northeast wall is another long wooden table and bench. It holds several pieces of cheese, two chicken's eggs, a portion of grilled leeks, a baked potato, a seared slaughterfish, a salmon steak, a raw rabbit leg, a pheasant breast, several loaves of bread, two bottles of alto wine and a bottle of wine. Hanging from racks above are four rabbits, four pheasant, and two salmon. In the middle of the northeast wall is a fireplace with a cooking pot in front, and by the hearth is a pile of firewood and woodcutter's axe. To the right of the fireplace is a cupboard holding more bottles of wine and alto wine, with more bunches of elves ear and frost mirriam hanging from the ceiling above. Coming out from the middle of the southeast wall is a large double bed with an end table at either side. On these is a couple of bottles of wine and a filled common soul gem. To the right, against the southwest wall is an unlocked non-respawning chest containing leveled items and small round wooden table with two chairs. On this table is a loaf of bread, a bottle of alto wine, and a bottle of wine. All cupboards and end tables in the location are non-respawning and safe to store items in. This page was last modified on 6 October 2016, at 08:31.